Welcome to Cashie Network Communications — Temporary portal page to all Cashie Network sites! Future plans will be implemented some time in 2020. 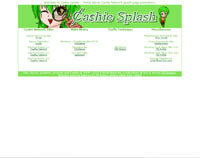 Site, layout, graphics, artwork and Cashie © 2009 - 2019 Cashie Network, a subsidiary of Javi S. Kunou (JS-Kunou). Website content belongs to JS-Kunou, unless otherwise noted.